Rouleau will lead the Tanenbaum Open Science Institute. Revenues generated from $10 million of the Tanenbaum gift will be used to fund the new institute’s operational costs. The other $10 million will go toward spurring open science efforts at other Canadian institutions. For Rouleau and his Neuro colleagues, this meant opening things up and giving other players access to the massive amounts of data that researchers at the Neuro have been compiling over the years. “There are a number of published examples of this, where scientists from outside institutions have looked at open datasets and made meaningful discoveries – even repurposing drugs to help treat patients with what would seem to be unrelated diseases,” says Jason Karamchandani, an assistant professor of pathology and a neuropathologist at the Neuro. Tanenbaum is a longtime senior executive with the Kilmer Group and a member of the Toronto Board of Trade’s Advisory Council. He is probably best-known as the chair of Maple Leaf Sports & Entertainment. MLSE is the parent company of the NHL’s Toronto Maple Leafs, Major League Soccer’s Toronto FC and the NBA’s Toronto Raptors (Tanenbaum played an instrumental role in bringing the NBA to Toronto). If it sounds as if Tanenbaum has a good grasp of these issues, it’s because he does. 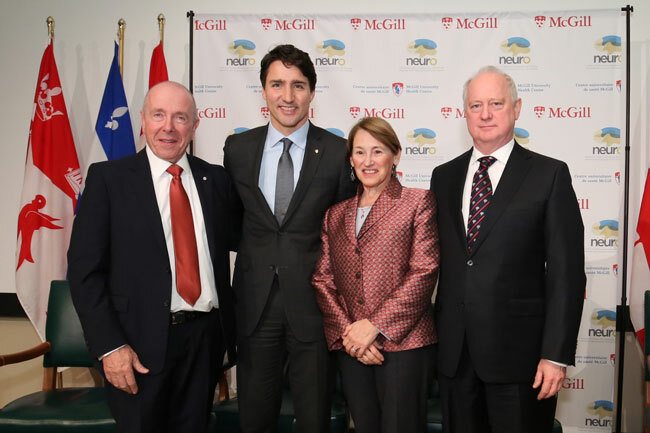 He is the vice-chair of Brain Canada, a national non-profit organization dedicated to furthering our understanding of the brain and brain diseases. It has helped support the work of more than 700 researchers across the country. He was also one of the founders of the Ontario Brain Institute. And he has been a member of the Neuro’s advisory board for six years. “There are a lot of dollars going into research on [heart disease] and cancer,” says Tanenbaum. “Historically, the brain has probably attracted about 10 cents for every dollar that has gone into cardiac or cancer research. Research is the key towards developing treatments or cures for these diseases. “The most exciting thing about open science to me is that it’s truly patient-centred science,” says Karamchandani. Karamchandani will oversee one of the new institute’s most crucial projects, building the CBIG-Repository (Neuro Open Science Clinical Biologic Imaging and Genetic Repository), a massive assemblage of research-related materials. “We’re aiming to collect clinical, biological, imaging and genetic data on patients with neurological disease and the goal of this is to make it open to researchers nationally and internationally,” he says. The Neuro expects its open science policies will spur new partnerships with other organizations and companies that are trying to develop treatments for brain diseases. Patents can get in the way of these sorts of collaborations. In a recent piece published in the journal PLOS Biology, McGill law professor Richard Gold, BSc’84, wrote that the Neuro hopes its approach to open science “will draw companies to the Montreal region, where the Neuro is based, leading to the creation of a local knowledge hub.” Gold, an expert on intellectual property issues who has been serving as an open science adviser to the Neuro, added that the plan was already bearing fruit – Thermo Fisher Scientific, a multinational biotech firm interested in neurodegenerative diseases, will be partnering with the Neuro. “Guy Rouleau’s leadership has been so important to this,” says Tanenbaum. “And a lot of credit has to go to the researchers and clinical scientists and all the people at the Neuro for taking this bold step – and it really is a bold step. Click on the thumbnail to learn more about The Neuro’s commitment to open science.